Taxpayers With Tax Problems Should Take Advantage of the IRS Shutdown! My colleague Steven Klitzner is advising Taxpayers who owe money, are being audited, or who have not filed their returns and who may be breathing a sigh of relief, during this IRS government shutdown; Wrong strategy! They need to take advantage of the situation. We have been advising our clients to get their ducks in a row, get their paperwork finished, get their offers prepared and/or request for installment payment plans prepared; so that when the IRS reopens they will be ready to submit their request to an overwhelmed IRS. Now is the time to get ahead of the IRS without the threat of them taking bank accounts or wages or closing businesses. * If you owe, get your financial documentation together. * If you are being audited, get your proof of income and expenses. * If you have unfiled returns, get them filed and get your current taxes paid. 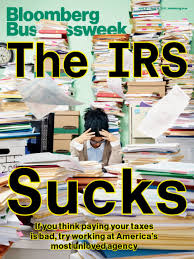 When the IRS goes back to work, they will be overwhelmed. The employees will be bitter and frustrated. They will want to make deals to clear their inventory. By being proactive and ready, taxpayers can help themselves by helping the IRS resolve cases.